Oaklandish and OMCA Hella Love Oakland. Photo by Sophia Hussain. After unveiling the “We Dream in Art” mural on the 10th street side of the Museum walls, we are moving from asking one question: "What is your dream for your community?" to another: "What does healing mean to you?" Our current phase of storytelling revolves around stories about healing. What words do you associate with healing? How do you heal? What would it look like for a community to heal? With the artist Brett Cook and our community partners, we’ve been working to identify healers in our community—the people whose actions inspire us and nurture us, the people who serve the imperative yet often overlooked role of emotional touchstone. Brett is interested in subverting conventional portraiture by interviewing his subjects and creating portraits that are a product of storytelling. He weaves his subject’s speech into the image to capture a person’s “essence.” Cook paints his adult subjects as children, with the idea that it will make the portraits of healers more accessible and more relatable. In our “We Dream” phase, a recurring theme was the relationship between art and activism. Oakland artists are especially adept at intertwining their artistic and political selves, and using their art as a way to make political ideas legible. As Peps 357 said in his interview, "art can help make a bold case for change." Transitioning to a focus on healing, we continue our engagement with public art, but zoom in on the restorative potential of art. Indeed, this is still a very political notion. What might we be able to accomplish or change if we started by healing ourselves? 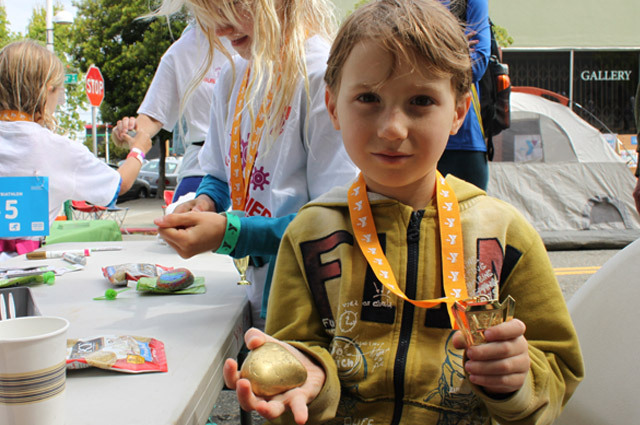 Tyler, 7, wants to invent a machine to make food healthier. 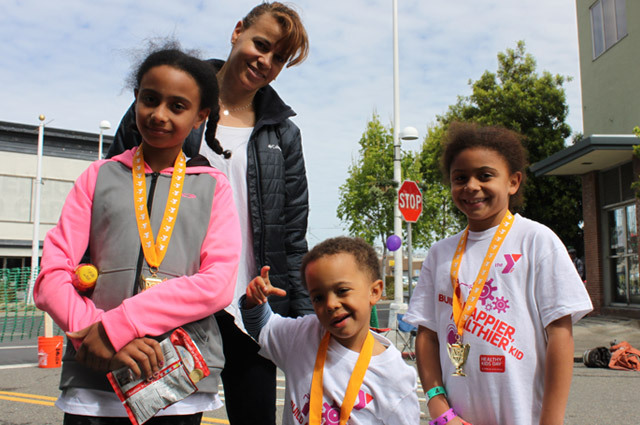 The perspective that our childhood may hold the key to our restorative potential made interviewing kids at YMCA Healthy Kids Day in Oakland a fascinating endeavor. Amidst a mini-triathlon, with kids running around the YMCA block, swimming laps in the pool, and then cycling on stationary bikes outside, our art-making table was a calm refuge from the day’s activities. Conversations with kids and their parents varied from viewing healing as a physical process, to cultivating well-being, and to imagining how our communities could be more healthy. I met Tyler, who at only seven years old has a preternatural taste for vegetables. How does he stay healthy? The answer is simple. “I like bell pepper, cauliflower, broccoli, grapes, cherries. Sometimes I roast cauliflower and that’s something I really like,” he said, crediting his mother for introducing him to cauliflower. Tyler told me that he wants to be an engineer because he loves Legos, and that he could use his skills in engineering to make food healthy. “There could be some machine that could make things healthy,” he said. “Like a machine that zaps into something. Mine would make like any food—even soda, but it’s good for you.” Though Tyler enjoys vegetables, he understands why kids prefer sweets. It seemed like a light bulb went off. “I’m gonna make a note about it,” he said. Jordyan’s family cheers her on as she completes the last segment of the YMCA triathalon. Many kids at the YMCA Healthy Kid day seemed to have been taught well and extolled the importance of exercise and balanced eating. One young girl I talked to, Pilar, spoke of wanting a healthier neighborhood. While she said that her community appeared healthy by most standards, she thinks it would be healthier if it had more racial diversity. As one of the few black girls in her neighborhood, she would like to see more people who look like her. Pilar (left) and her family. Celeste Stanley, a mother who lives in West Oakland, spoke about the neighborhood’s attempt to heal from a history of trauma. She works on a grant committee with West Oakland residents, that gives grants up to $2000 to other West Oakland residents who have an idea for a community project. 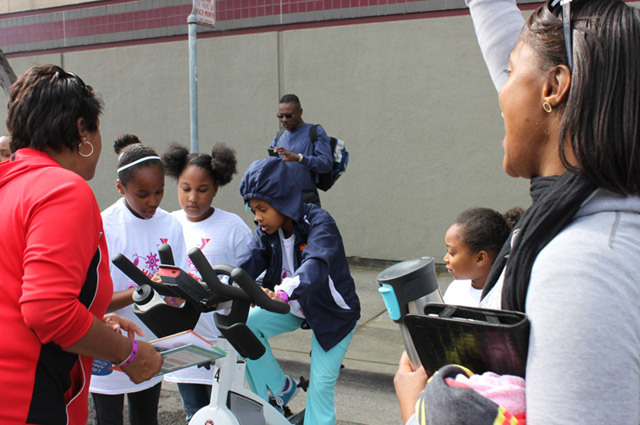 “It’s all about what’s happening in West Oakland that’s great and positive and getting new energy and new opportunities and resources,” she said. Though Celeste and her family moved to West Oakland only seven years ago—a short amount of time, compared to the generations of families rooted in the neighborhood—she views her family’s investment in being active community members as another a model of hope and healing. I carried these questions over to the next day, when the Oakland Museum tabled outside of Oaklandish in Fruitvale. Many said they’d seen encouraging signs of improvement in the neighborhood, especially as the commercial corridor expands. A young woman named Hailee pointed out that when we talk about healing Oakland as a whole, it is important to consider how different demographics within the city view healing. Many people with deep roots in Oakland and the Bay Area, she said, have experienced harm that newcomers can’t easily conceptualize. “I think its important that we’re on the same page about what we’re healing from,” she said. 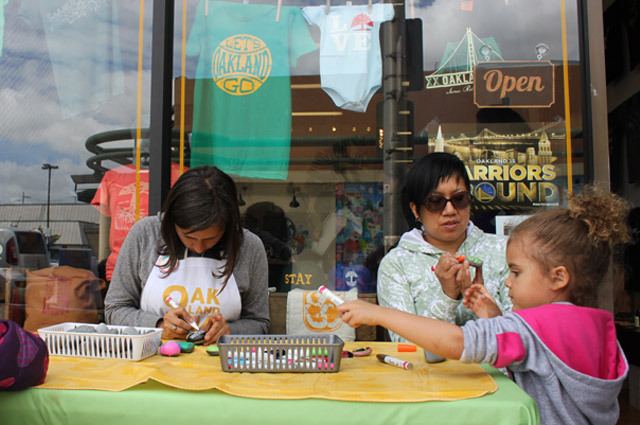 The Oakland Museum of California art making table outside of the new Oaklandish store in Oakland's Dimond district. In the background of these conversations, of course, is gentrification. There is a tacit understanding that many Oaklanders have undergone housing segregation and faced generations of structural discrimination. And yet for many, including native Oaklanders, the sign of new buildings and a reinvestment in the city structure, is a sign of change that might point towards healing.